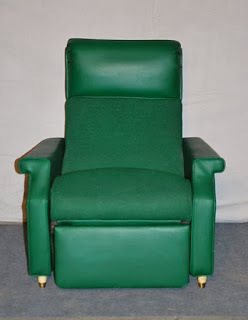 Unlike you the chair didn't change, it's still that sombre dark green with the handy side pocket in which you keep all your remote controls so your wife has to ask you to please turn on or off the radio, the television , the d.v.d. player and all the other electronics. You used to take out a control and turn on the television as loud as possible when you got bored with visitors and pretended not to hear it when your wife pleaded to turn it off. You yourself did change: the sturdy bon vivant became a dead tired shadow of that man. Your eyes lost their sparkle and most of the time you stare out of the window, a pile of books next to you untouched on the little table next to you. The remote controls stay in their pocket. My mother once in a while will ask you something, almost like she is checking you are still there. You lost interest in most things, starting a conversation with you is like dragging you from the bottom of a very deep sea to the surface. I don't visit often after I left the country and in earlier years it was quite an event for you and my mother. But now it is like she is trying to convince you constantly somebody is there with you in the living room. We were never mates or buddies or whatever you want to name it, but during this stay it's almost like you forgot we are related. I look at you, hear the clock ticking and try to read on, like my mother is doing. Suddenly you call out her name and announce that you need to go to the bathroom. You know very well she can't help you with that, being unable to have walk normally. Old age is hitting you both really hard, I wonder if I will be like that when I'm in my nineties and realise it will be me who has to help him to the bathroom. I tell him, I will do it, I can help. My mother looks up from her puzzle. I see anxiety in your eyes, almost a fear and you refuse. My sister and her husband will help you, you say. I answer that they will not be here for at least another hour, maybe even two, you don't have a choice: it's me or no help at all. I get up and stand in front of you, stretch out my arms towards you, invite you to take my hands. "No, no, you can't!" you say and there is panic in your eyes, "Martin has to do it." "He's not here, you don't have a choice", I grab your hands. "We'll see about that! ", I take your hands and pull you up. Your eyes are wild now and I feel all your muscles tightening. All the muscles that you still have. I know that not long ago there would have been no way I could have got you out of that chair, but things go quite smooth even with all your resistance. I walk backwards leading you step by step to the toilet, humming a waltzing melody. "What a nice dance, we have! ", I joke. You grumble, concentrate on the little steps you take. We manage alright and I wait in front of the bathroom door till you are finished. I hear you peeing and sighing from relief. When you open the door again, you stretch a hand out to me. I take it and use the other to close the door before taking your other hand. We make the same dance again and you end safely in front of your chair. When I make you sit down, you squeeze one of my hands very lightly. Something has changed, we both know it and we also know we will not talk about it. There is no need.